In May we published an article on the burden of cancer attributable to infection in The Lancet Oncology. 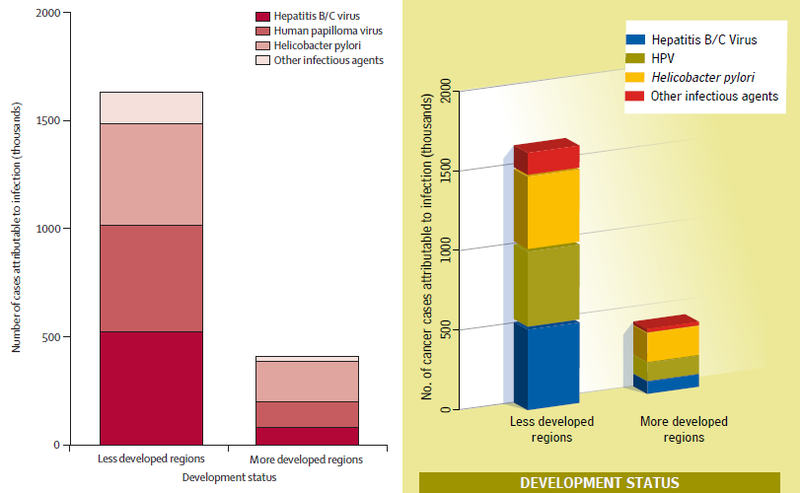 On the left is Figure 2 from the article, which shows that the majority of the burden is attributable to just four infectious agents. This is essentially the same as the grey scale image we submitted (drawn with R) but has been tinted to match The Lancet’s pink colour scheme. On the right is the reproduction of our figure that appears in the September issue of newsletter HPV Today. As you can see, they have added some details to our graph, none of which actually convey information: 3D perspective, gaps in between the components, a shadow effect, and a gentle fading of the background across the x-axis. There is an interesting use of colour too. The deep red colour emphasizes “Other infectious agents”, which was rather the opposite of what we intended. The x-axis label “Developmental Status” – now strangely detached from the rest of the graph – is the same colour as the bar component corresponding to HPV for reasons that are not entirely clear. At least they didn’t turn it into a pie chart. They had to rerender in such a way to avoid copyright issues. Could have used an horizontal barchart though. That’s a good point. The figure needs to be redrawn and not copied, but I am not sure why they needed to add all the chart junk. By the way, we published the numbers in one of the tables, so anybody could re-draw the bar chart by feeding these numbers into an appropriate software package.